1Research Scholar, Karpagam Academy of Higher Education, Coimbatore-641 021, Tamil nadu, INDIA. 2R and D Centre, Natural Remedies Pvt. Ltd. Bangalore-560 100, Karnataka, INDIA. 3Head and Professor, Department of Botany, Karpagam Academy of Higher Education, Coimbatore-641 021, Tamil nadu, INDIA. 4Department of Environmental Sciences, Bharathiar University, Coimbatore-641 046, Tamil nadu, INDIA. Background: Pomegranate (Punica granatum L.) is universally known for its therapeutic properties due to its potential bioactive compounds. However, there is no established scientific study on antipsoriatic activity of pomegranate fruit rind. The aim of the study is to evaluate the anti-psoriatic activity of the isolated compounds and the extract from the fruit rind of P. granatum. In our previous study, the isolated compounds were evaluated for antioxidant potential. In continuation to the previous investigation, the present study is taken up to evaluate the extract and compounds for in vitro anti-psoriatic activity. Methods: Chromatographic techniques were employed to isolate the compounds from the aqueous acetone extract and in vitro anti-psoriatic activity was determined by thymidine phosphorylase inhibition assay. Results: From previous phytochemical investigation, three compounds were identified as Punicalagin, 2,3(S)-hexahydroxydiphenoyl-D-glucose and Punicalin. In the present study, the extract and the compounds were evaluated for anti-psoriatic activity. The results reveal that the isolated three compounds showed inhibitory activity of 89% to 95% against thymidine phosphorylase. Aqueous acetone extract also exhibited 87% inhibition. Conclusion: Punica granatum is an ideal plant for further investigation to prove its anti-psoriatic activity. Jacob J, R G, P L, Illuri R, Bhosle D, Sangli GK, et al. 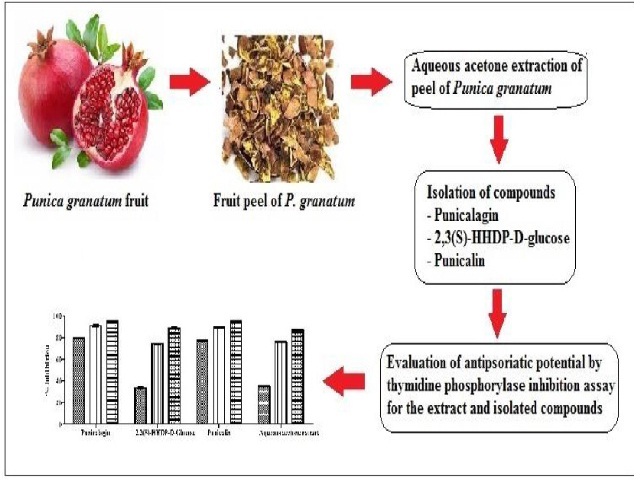 Evaluation of Anti-psoriatic Potential of the Fruit Rind of Punica granatum L. Pharmacognosy Journal. 2019;11(3):75.